2018-2019 Season: With the ever-expanding range of outdoor winter activities, we will gear our grooming to accommodate our lodge guests needs. 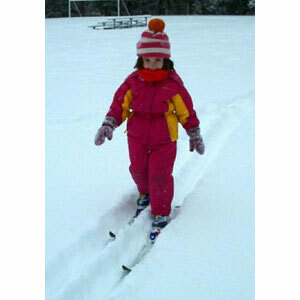 The weather and snow conditions, as always, will be a factor in what we offer on any given day. Day visitors: Rather than adhering to a specific schedule, we will occasionaly be open for day visitors. Always check Trail Conditions before planning a trip to Stump Sprouts. We will update this page frequently with information relating to open/closed status, hours of operation, appropriateness of condions for skiing/snowshoeing/biking. 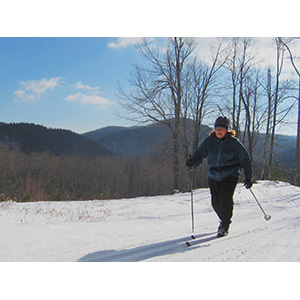 Twenty-five kilometers of trails ranging from gently rolling groomed and track-set loops to challenging back-country routes await skiers of all abilities. 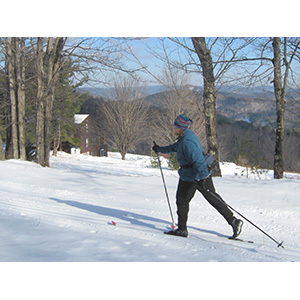 Designed specifically for classic skiing, our trails are generally too narrow in flatter areas to accommodate skate skiing. A favorite destination is the summit of Lone Boulder Hill, where a large glacial boulder stands guard near a breathtaking 3 state vista. Don't let the lack of snow in your backyard fool you; high elevation here assures some of the best natural snow conditions in Southern New England. 40 years of constant refinement of the trail system and grooming equipment have resulted in great skiing, even when you'd least expect it. The emphasis in developing this exciting trail system has always been to blend exhilarating outdoor fun with a sensitivity towards the natural environment. 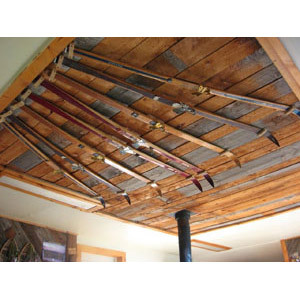 We rent all sizes of cross country skis/boots/poles. 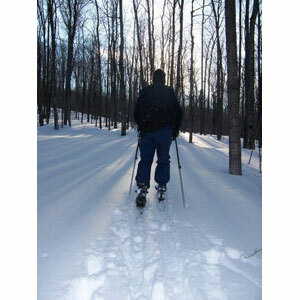 Those seeking enjoyment in the winter woods at a slower pace can snowshoe on our trails as well. 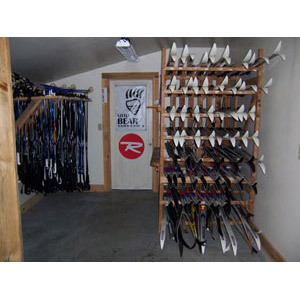 Both adult and children's snowshoes are available for rent. We welcome winter bikers when the conditions are right. Our groomed twisty turny trails are a blast to ride when the snow firms up. There are days when you can ride but you can't ski, such as when the cover is thin or patchy. Powder days are reserved for skiers and snowshoers. We do not rent bikes. See below for more detailed info! During low snow or icy conditions, hiking our trails is very popular with lodge guests. We rent Micro Spikes that work with most hiking boots to assist with traction when conditions warrant. From late December to mid-March, we offer one of the most affordable packages anywhere. Meals (the great food is reason enough to come! ), accommodations in one of our cozy bedrooms, access to trails from our door are included in one low price. Lodging with or without meals packages are available to groups by special arrangement. There are plenty of things to do even if it doesn't snow. For alpine skiers and snowboarders, Berkshire East Ski Area has continuously enlarged its snowmaking system and is only a few minutes away. They also have a tubing hill and an Alpine Coaster ride for non-skiers. 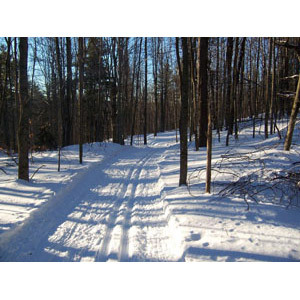 There are numerous winter hiking & mountain biking possibilities as well. Set off on your own or enjoy a guided hike and learn more about the woods in winter with Lloyd. Touring the village of Shelburne Falls and other picturesque New England towns in the area is another favorite activity. A trip to MassMoCA is worth it at any time of year. In fact, many of our "old standbys" return year after year and don't ski at all! Always check the trail conditions page of this website before coming to see if we are open for bikes on the day you plan to come. You must be a day passholder or lodge guest to bike our trails. Don't ride when the snow is too soft. This damages the groomed surface. 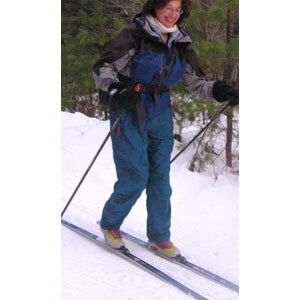 If the snow becomes too soft while you are out on the trails, consider switching over to skis or snowshoes...you'll have more fun! Bikes yield to all other users. Skiers don't have brakes! If we have set classical ski tracks, please do not ride in them. We will set them to one side to allow for bike & snowshoe use on the rest of the trail. We may occasionally open for night biking. If you have a group that is interested contact us. We may organize special events for bikers on short notice when conditions are right. Copyright 2019, Stump Sprouts. All rights reserved. Site design by Anne Campbell Design. Log in.